Chief Executive Steve Jobs today announced the latest in Apple's range of consumer products. The product itself has typically been shrouded in some secrecy, although industry watchers had been following rumours circulating on the internet that company executives have found it difficult to cope after the climax of their iPhone hype. Technology analysts today praised the innovation from Apple saying it was the natural evolution for the brand experience in long gestation, high desirability products such as the iPod, the iPhone and the much heralded Apple TV. Marketing analysts said it was pure genius of the company, to make the announcement when the product was only a name. 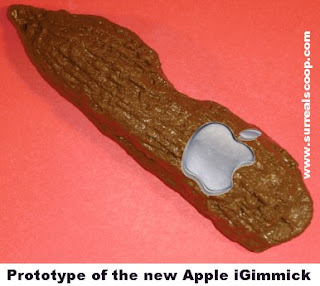 Apples denied rumours it was working with the Meteorological Office in each of its launch markets to select a suitably rainy launch date for the iGimmick.